Unfortunately this blog will conclude my North Carolina series until future visits. Our last day in North Carolina was hard for me. The fact we had to go back to reality in Pennsylvania sank in and we just weren’t ready to go. It seemed the week flew by and there was so much more that we wanted to do and see, but we knew one day we would return. On our last day we decided to do something simple. First thing in the morning we decided to investigate the abandoned tobacco barn that was on Howells at the Moon Farm’s property. It was just a short walk into the woods right by our cabin. 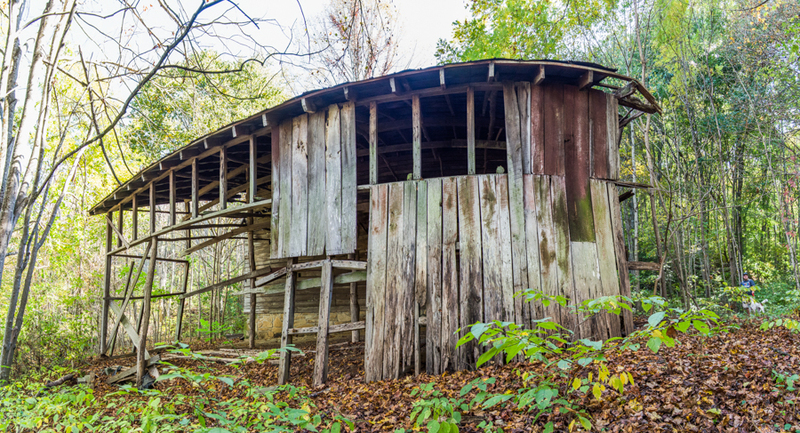 We didn’t venture inside of it because it was pretty worn down and even in the farm’s guide it asked not to go underneath the falling wood, but just seeing it’s outer shell it had a sense of beauty. To some, run down wood just looks awful, but to me it has a story to tell. While walking back through the woods towards the cabin I found a great treasure that I have preserved on my wedding table now. I happened to be staring down and found a turkey feather along with a sun bleached turtle shell that was a couple feet away. 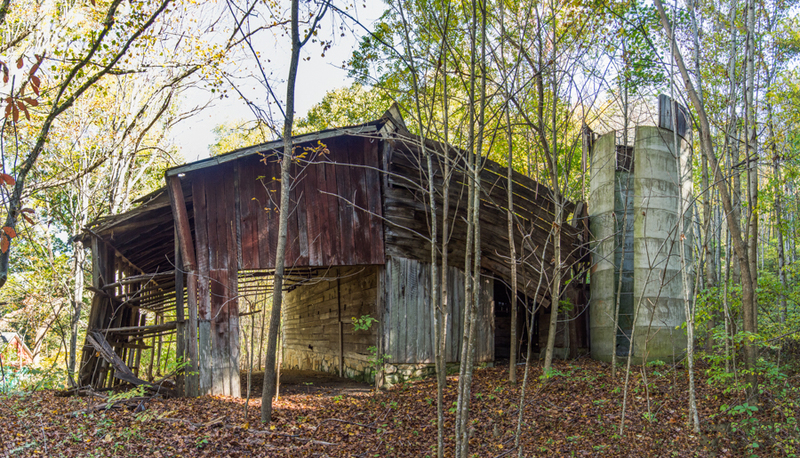 After seeing the old tobacco barn I let Brian decide what we were going to do that day. Of course he did some research himself and took us to the Wheels Through Time Museum. I didn’t take my camera inside with me because judging from the pictures online the warehouse was very badly lit and wouldn’t have done me any good. When we got there I came to find that I was right. It wasn’t a total loss though because in the parking lot when we were leaving I happened to look up and spot a massive wasp’s nest. If anyone knows me, for some reason I just love taking pictures of nests, especially when the leaves surrounding it are beautiful colors. I did however take some photos with my phone just for this blog to show my audience encase they are ever out in or near Maggie Valley, NC. 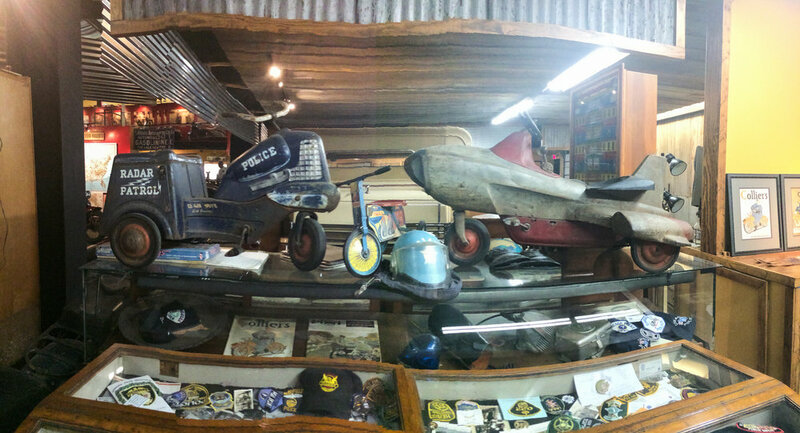 Stop by and see it for yourself, especially if you’re a big motorcycle or antique car lover. It was pretty neat to see what they all had in the warehouse, considering there were two floors to explore. After that we went out to eat one more time and then spent the rest of the evening at the cabin with Rusty. North Carolina was a great experience. There are so many adventures I want to have in the future and I hope we can come back to visit soon. I promise if we do I will add onto this blog series and see where the new road trips take me. From the breathtaking mountains, to the quiet cabins, and to the home cooked meals, it’s a trip we will never forget. Thanks again Howells at the Moon Farm for making our honeymoon so relaxing and wonderful! We hope to visit again soon!